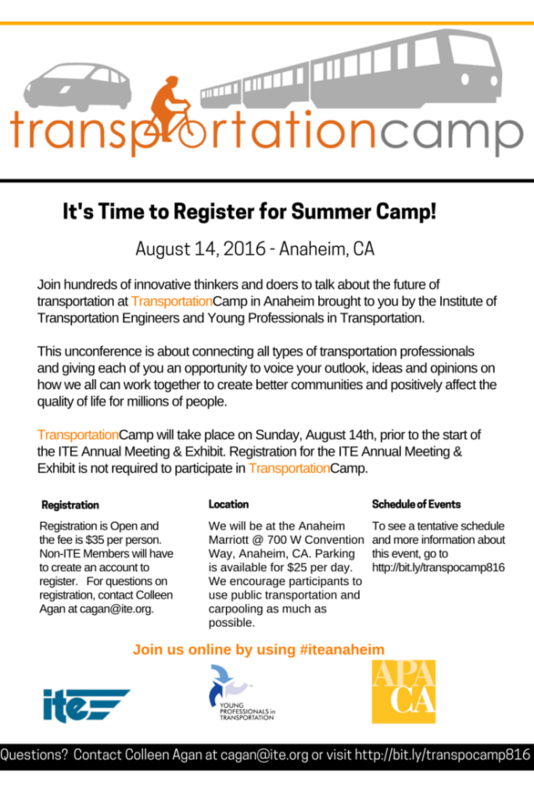 Join hundreds of innovative thinkers and doers to talk about the future of transportation at TransportationCamp in Anaheim brought to you by the Institute of Transportation Professionalsand Young Professionals in Transportation. This unconference is about connecting all types of transportation professionals and giving each of you an opportunity to voice your outlook, ideas and opinions on how we all can work together to create better communities and positively affect the quality of life for millions of people. This is not a traditional conference. The session topics and activities are suggested by the attendees. TransportationCamp provides an opportunity for every attendee to be a participant in shaping and leading the event. Be prepared to get involved and meet people. Major themes reflect the backgrounds and interests of the participants. Questions? Contact Colleen Agan atcagan@nullite.org or visit http://bit.ly/transpocamp816.